A question many ask is what are the best dogs for children? No doubt, it is a good and valid question. We believe there is another important question to be asked. It is a question that may be even more important in keeping your children safe. Do you want to learn more about providing a safe environment for your children and your dog? 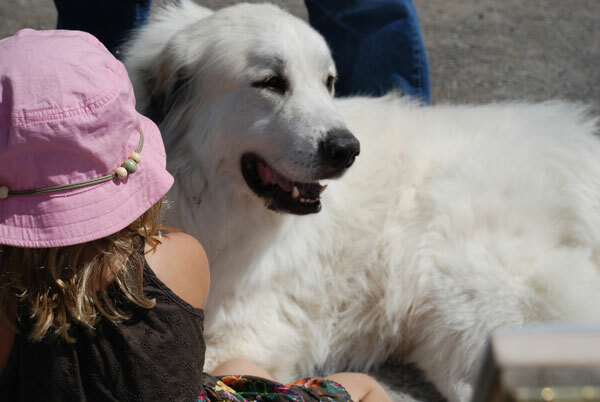 Do you want to learn why there is more than just choosing one of the best dogs for children? We invite you to read on. The safety of your children depends upon much more than the breed of dog you choose to bring into your home. Although some dogs are better suited to life as the family pet, all dogs can be dangerous and harmful if not managed properly. And it’s not just the dog that needs management… it’s the children as well. We encourage you to carefully research dog breeds before bringing one into your home as a member of your family. This is especially true when children are in the home. But once that choice has been made, your work has just begun. And what work is left to do? Let us share with you what we know. It can make all of the difference in your enjoyment of your dog and the safety of your children. 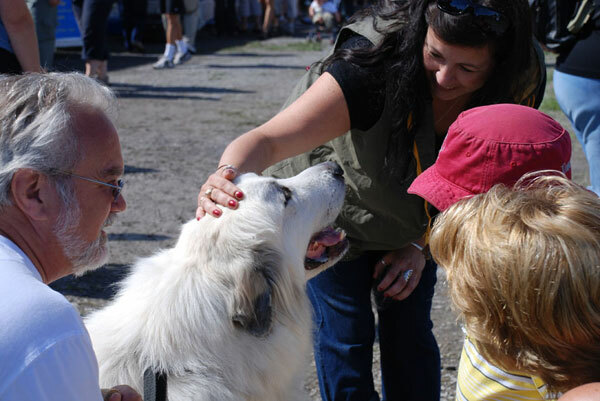 Gus, A Great Pyrenees Mountain Dog, being introduced to children at the market. As a rescue organization, we have dogs that are surrendered for many different reasons. One reason is that a dog has snapped at a child and can no longer be trusted. We have seen first hand the consequences of this and we know it can be prevented. That is why we want to bring the relationship between the dog and the child to the forefront. That is why we want to impress upon you how important it is to not only train your dog, but to train your child to treat a dog with respect. Why? It’s as simple as this… The best dogs for children are dogs with appropriate temperament and training, that live in an environment where the children have also been trained properly. One without the other is a recipe for potential tragedy. Chances are you’ve heard of a child being bitten by a family dog. Of course you have… otherwise you wouldn’t be researching the best dogs for children. In these situations, parents or guardians cannot believe it has happened because the dog has always been so good with the children. It comes as a total shock. But if they had stepped back and taken an informed and objective view, they may have seen it coming. We hope we can help provide that view. Let’s look at the interaction between the family dog and the children. The dog’s behaviour is very revealing if you now how to read it. 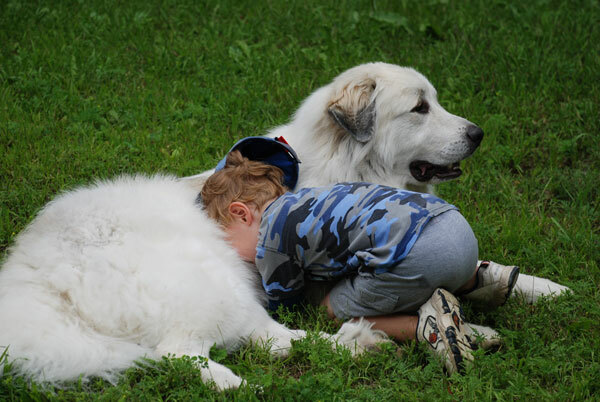 Many parents think it’s so cute when the child follows the dog as he moves away from the child, pulls his tail or ears, sits on him, pulls his coat, and maybe even sticks something in his ear. It must be okay… after all, the dog doesn’t appear to mind. But what did they miss? How about this? What they didn’t see was the dog’s body language. Did they see the ears go back or the grimacing facial expression? Did they notice the dog’s head go down… the dog trying to walk, run or skulk away? Did they notice his tail go between his legs? There may have even been a growl. Did they notice? Some would say that anyone with common sense would see by the dog’s body language that the bite was going to happen. It was just a matter of time. But it is more than common sense. It is a matter of knowing what to look for. So be very observant of not only your dog’s behaviour, but your children’s behaviour as well. We have seen cases where the family dog is expected to tolerate behaviours that would certainly test a human’s patience to the point of exploding. How reasonable is that? At what point does having disrespect for the dog and the dog’s needs result in a nasty outcome? Sadly, it’s too often. Time To Rest - After 15 minutes of all out "Catch Me If You Can"
Dogs communicate very clearly. It’s our responsibility to understand them. When you see a dog continuing to walk away from a child who is following him, the dog is telling the child that he wants to be left alone. It’s imperative that you ensure that your child knows that. If a dog has something it wants you to know and you ignore him, chances are he will escalate his behaviour to get your attention and to get the result he wants. So, when the dog has no place left to go, he might turn and snap, growl, bark and snarl to try, yet again, to tell the child to leave him alone. And far too often, the dog is blamed and worse, treated as being a dangerous dog. So think about it… if someone incessantly followed you as you tried to get away, then backed you into a corner with nowhere to go, you might turn and yell and maybe even become aggressive or violent. As a parent or guardian of the child, you must know the signs. You must know what the dog is trying to communicate. If all signs are ignored by the guardians in charge of the child, a dog at the end of its wits may cause irreparable damage to a child which may even result in death. And sadly, in many cases, the dog pays the price. He will be quarantined and probably euthanized. And the tragedy is, understanding how to interpret the dog’s behaviour could probably have prevented the bite. More importantly, teaching children the proper behaviour around the dog could have prevented the bite. And most important, if a responsible adult had been supervising the child and the dog, the bite could have been prevented. It is no surprise that when a dog feels bullied or cornered and threatened and has no other option; his instinct is to stop the threat. And, because none of his warnings have been heard, his natural response is to bite. That is why simply choosing the best dogs for children is not enough to ensure a child’s safety. It also requires a guardian who knows how to read the dog’s behaviour, who knows how to teach their children respect for dogs and who will intervene when needed. So what will provoke a dog to bite and what can you do to prevent it? Learn more here.